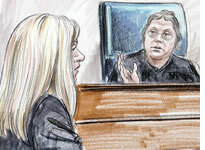 Carla Martin's witness tampering wasn't rare, just sloppy. The reaction to the disclosure that the prosecution had coached some of its witnesses in the trial of Zacarias Moussaoui has been swift and surprisingly furious. Commentators and pundits across the political spectrum have professed shock and outrage; the prosecution has humbly apologized-even hinted at criminal sanctions for the offending lawyer-and Judge Leonie Brinkema, furious at what she described as "the most egregious violation" she has ever seen, has precluded the government from introducing a number of witnesses she has described as "irredeemably tainted." All this stems from the revelation that Carla J. Martin-an attorney with the Transportation Security Administration-did three main things regarding seven Federal Aviation Administration witnesses: First and worst, she e-mailed copies of trial transcripts to future witnesses, along with what amounted to instructions about shaping their testimony, in direct contravention of a judicial order. Second, she prepared some of her witnesses together rather than separately. And third, she advised a number of witnesses not to speak to the defense and may have also falsely informed the defense that several witnesses didn't want to be interviewed. There is no question that this sort of behavior violates the spirit of fairness that is supposed to guide our criminal-justice system. There is also no question that what Martin did happens all the time-just not via e-mail. What Martin did is beyond foolhardy. Rarely does one see such an incendiary combination of overt rule-breaking and (thanks to the indelible record of e-mail) demonstrable proof of that offense. Indeed, Judge Brinkema has already indicated that Martin will likely face both civil and criminal charges. Still, it is the lack of deniability of Martin's actions-as much as the conduct itself-that has created the government's problem. The order in question was issued on Feb. 22, 2006, and based on Rule 615 of the Federal Rules of Evidence. It explicitly barred all but two of the prosecution's witnesses from being present in the courtroom prior to their own scheduled testimony. It further barred all but these two witnesses from reviewing the transcripts of other witnesses. By e-mailing these transcripts, Martin flagrantly and demonstrably violated that order. Had she gone about it some other way-as commonly happens-it is legitimate to wonder whether the government would have even come forward with its mea culpa. The unfortunate reality is that in a competitive and charged prosecutorial environment, coaching witnesses generally, and even much of what Martin did specifically, is fairly commonplace. And while the national shock over Martin's actions suggests that Americans remain deeply confident in the criminal-justice system, and profoundly invested in rules of fairness, what seems to have gone unnoticed is that most of those rules have, in practice, long since gone by the wayside. Witness-coaching isn't just commonplace, it's endemic. Every single day, in state and federal courts across the country, prosecutors and defense lawyers summon their witnesses and coach (most would prefer the term "prepare") their testimony. This preparation is not only permissible but important, and it routinely includes a discussion of the questions to be asked, and even helpful hints on improving the testimony. It is not at all uncommon to prod a witness's memory, dredging up old police reports, grand jury testimony, or prior conversations to get a witness to say what a prosecutor wants them to say, and in the way a prosecutor believes will be most effective. In the dozens of prosecutorial prep sessions I've witnessed over the years, I've seen prosecutors threaten, cajole, and remind witnesses in no uncertain terms of what they want said on the stand, often by referring to other evidence in the case and even the statements of other witnesses. "Don't worry about it, I have X to say Y" is as common a refrain in these sessions as, "What happened next?" What guides such coaching sessions is not some abstract ideal of the independent witness, but rather the question of how any coaching could play later, on cross-examination. A good prep session, in other words, will effectively shape a witness's testimony to maximize its impact while minimizing the danger that cross-examination will pull back the curtain on what is actually happening. You coach just well enough to diminish the appearance of coaching. And that's precisely why Martin's second blunder-the decision to prepare witnesses at the same time in the same room-isn't so much forbidden as plain stupid. Simultaneously preparing witnesses allows even a moderately skilled defense lawyer to later argue, accurately, that the witnesses came together and made up a story. That's why having people in the same room for prep sessions is rare-it's just hard to get away with. On the other hand, cluing individual witnesses in to what the other evidence is in the case, and how their testimony fits into the overall theory, isn't. Nor, sadly, are lawyerly instructions to witnesses to avoid talking to the defense. Again, the name of the game here is not to avoid engaging in such conduct, but to avoid doing it in a way that can stick. Prosecutors know full well that having their witnesses talk to the defense can damage their cases, and they generally use all kinds of tools to avoid having that happen-most closely by guarding the identities of their witnesses and refusing for as long as possible to turn over their names. Prosecutors don't rely only on these structural disincentives, though. Like Martin, they regularly and explicitly discourage their witnesses from talking to the defense. They just do it in a way that has some plausible deniability. The traditional formula for this instruction is as follows: "Now I can't tell you not to talk to the defense, but I want you to remember-you really, really don't have to, and so if someone comes asking to talk to you, you really can just tell them to call me instead and I'll take care of it." Prosecutors present this as simple and reasonable witness empowerment, and judges routinely sanction it, even as every witness with an IQ over 50 reads the statement for what it is: A direct instruction not to talk to defense counsel or his investigators. It's why-time after time-when defense lawyers and investigators knock on witnesses' doors, they're greeted with the predigested, and perhaps more honest, version of this little prosecutorial speech: "My DA told me not to talk to you." While it would be a better world if the defense had equal access to prosecutors' witnesses, Martin's real mistake wasn't in keeping her witnesses from the defense team. It was in doing so through lies, instead of mere manipulation. Martin's actions in the Moussaoui case peel back the curtain behind which big criminal trials play out, and they offer a candid look at just a few of the ways that basic notions of fair play may fall prey to the corrupting influences of a competitive prosecutorial culture. But for all the recent scapegoating of Martin, her career as a lawyer is likely over, and the Moussaoui trial is on the ropes; it's wrong to portray her as a renegade outlier or pretend that what she did was an isolated incident. While it's certainly true that her conduct was flagrant and provable, the fact that most prosecutors aren't foolish enough to commit their folly to writing is hardly evidence that it doesn't happen. Indeed, if Martin's rather cavalier conduct shows anything, it is that these behaviors are sufficiently commonplace as to happen among the most elite prosecutors engaged in important federal cases. And if it happens there, just imagine what goes on down in the drab and common precincts where most criminal law is practiced. Photograph of gavel on the Slate home page by PictureArts. David Feige has written for the New York Times, the Los Angeles Times, and the Washington Post. "Indefensible", his book about the criminal-justice system, will be published June 6.